it is extremely unlikely that it is an “irregular b wave” part of an extended flat- i could count 5 waves up from 2722, and a flat is 3-3-5 with b wave having 3 waves and not 5. $14.2 Billion flowed into stock funds last week, including $12.2 Billion on Tuesday, the most since Sept. 18th, the SPX peak. Domestic inflows no at a 1 year high at $25 Billion. 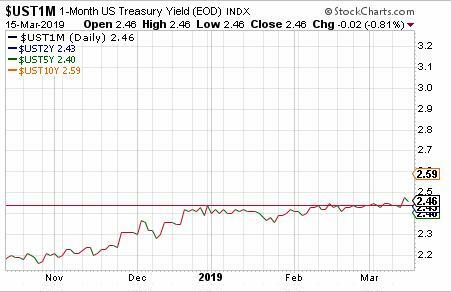 I notice that along with stocks having a good week, the 1 Month Treasury (yield) had a good week. And, when you look at it compared to other rates, that is not good that 1 month is so strong. this stock market is going up gangbusters for almost four months. But to say this is the continuation of a secular Bull Market seems folly. I see the walls closing in. Tom, the rate on the 1 month T-Bill is basically dictated by the FED and the Fed Funds range. It’s right where it should be. But the question is, will Chairman Powell cave into political pressure, from the White House and blowhards like Jim Cramer, to lower rates. I think the fact that 1 month Treasuries rose this week mean Powell has a spine. He will not cut rates. As of last Friday, the Fed Funds futures were pricing in nearly a 37% probability of a rate cut by next January. 2) set the stage for a very prolonged next recession, where the FED has few tools left in the toolbox. But you might be right here. Maybe he will cut. Everybody these days wants instant gratification, with no consideration for the longer term. 1.) 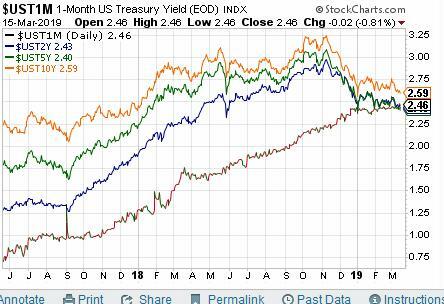 If Powell were to cut rates at some point this year, I don’t see how it would “destroy the bond market” . 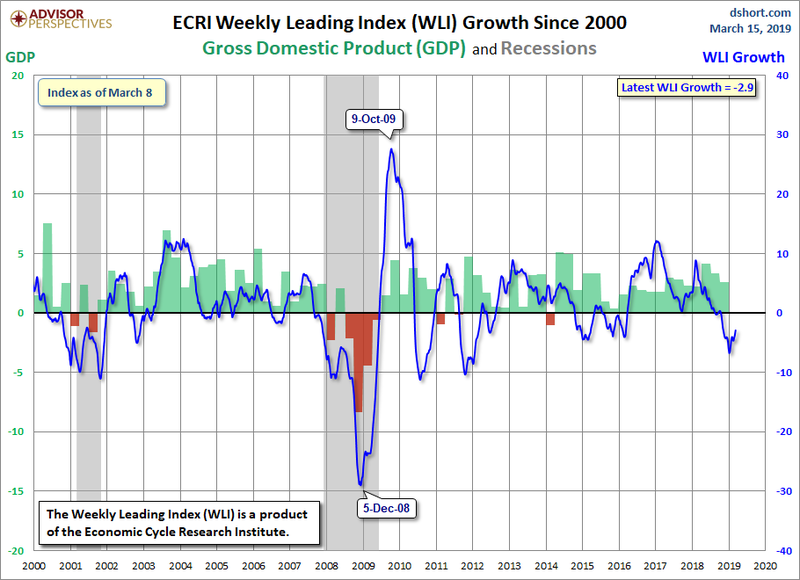 . . especially since any cut in rates would be associated with weaker economic data. 2.) The FED already has few “tools” left in its tool box. And Congress and the Administration cant do anything from the fiscal side because they are already running $1.0 Trillion dollar budget deficits on an annual basis. This is Basic Econ 101A. The shock “absorbers” for the next Recession are literally gone. 4.) While Non-Financial Corporate Debt as a percentage of GDP is not that accurate a metric (its at a record high, roughly 47%) – – – even if one were to look at comparing investment-grade net debt to EBITDA (which is a decent measure of cash flow), non-financial corporates look almost as leveraged as they have at any time since the Peak hit during the Dot-Com boom 2 decades ago. Excluding the tech sector (which enjoys borrowing against impressively high cash flows), corporate investment grade debt looks as though it is at a historic high. 5.) Debt with AAA ratings has almost ceased to exist. The biggest increase in debt volume has clearly been via the lowest quality investment grade credits and in below-investment grade. It’s almost as though Corporate America is gaming the ratings agencies… by borrowing as much as they can, while not suffering a downgrade which would lead to higher borrowing costs. 6.) Russell 2000 non-financial net-debt & EBITDA is so far ahead of actual cash flows its not even funny. Net debt is currently running at 4X EBITDA. 7.) I’ve never believed the “Pie in The Sky” GDP claims by the Administration of 3.5% GDP primarily because companies just dont have any pricing power. They are so concerned with maintaining market-share, that they are unable to raise profits and as a result, must take a hit on margins . . . while worrying about using existing cash flow to pay debt service and increased wages. Brick and Mortar retailers vs Amazon is a prime example of this. 8.) I’m probably in the MCG Camp, given that I dont see how the market heads into a Wave 3 type Bull Run to 3400, given that earnings and margins have already peaked. You are listing so many “trees”, you obviously do not see the forest. The Bond Market is simply and clearly an organized forum to rent out your unused money. This activity is completely analogous to 1) renting out a car 2) renting out a heavy machine (e.g. a bulldozer), 3) renting out a house. 4) etc. These activities are all supposed to proceed with the renting party making a profit. But now, in the case of renting money, the FED has decreed, you have to do it for free. 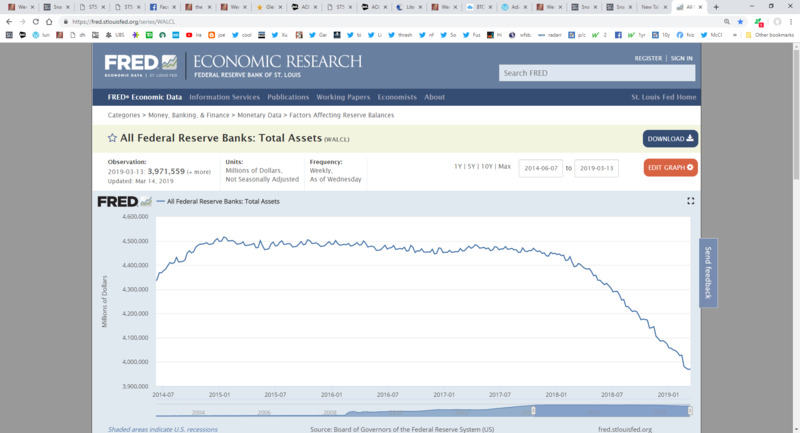 Now, the FED IN 2019, this is an EMERGENCY, as it has been for the past 11 years. So, the people who rent out their money (instead of cars, bulldozers, or houses) are required to do it for free, and It’s all OK now. BTW, if you just wander down the the grocery story and try to buy a few apples, or 12 cans of Pepsi, you will see that real inflation is way over 5.00%. Perhaps closer to 10%. In summation, if he FED gives way to popular demand and starts cutting returns on bonds, we will create a truly moribund economy, because of the fecklessness of the FED. I don’t expect that as of today, but would not be shocked if they do that. 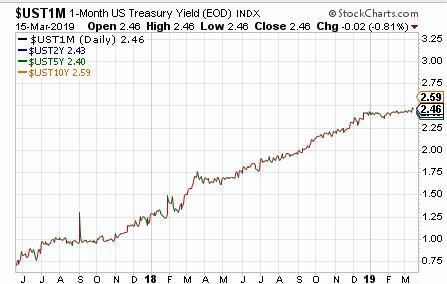 How would any of your claims….result in “destroying the Bond market” ? Most of the bond market buyers are institutions who buy bonds because they are directed to buy bonds in their charter. It has been this way for a very long time. When it becomes abundantly clear that they can’t make money owning bonds, the charters will be changed, and it will stay that way for a very long time. State and local pension are huge buyers of bonds (some exclusively buyers of bonds). One particular ramification of the FED’s zero or near zero interest rate policy is that these pension funds are woefully underfunded now. In other words hundreds of thousands or perhaps millions of municipal workers have underfunded retirements. This will cause massive civil strife. All done to continue levitating the stock market, which I think is done mostly to fund stock buybacks and grotesque retirements for officers of Publicly traded securities. Stellar work on the Weekend Update. Thank you to the OEW group and Christine for the fine production. No doubt Tony is proud. Many thanks for keeping up the good work. Thank you Christine and OEW group for the updates. I do like the clean charts on the weekend updates. I know your father’s chart list could be overwhelming to update. Just a suggestion, just update spx, indu, and compq. Enough said, just appreciate you and the OEW group. Thanks. The money has to go somewhere, might as well be into stocks, for now. In addition, over the weekend I found: “It’s possible wave-a of -2/b has completed at Friday’s SPX2722 low and wave-b of -2/b is underway. 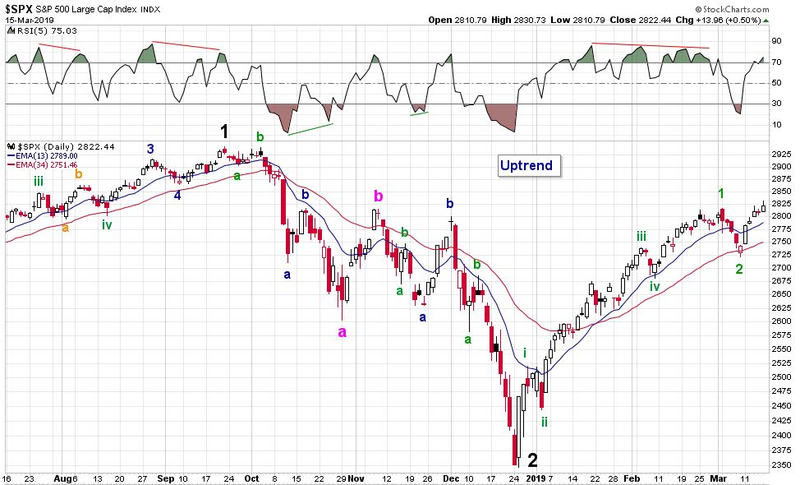 It depends on how high the currently anticipated bounce will carry: above SPX2767 and wave-b is confirmed. 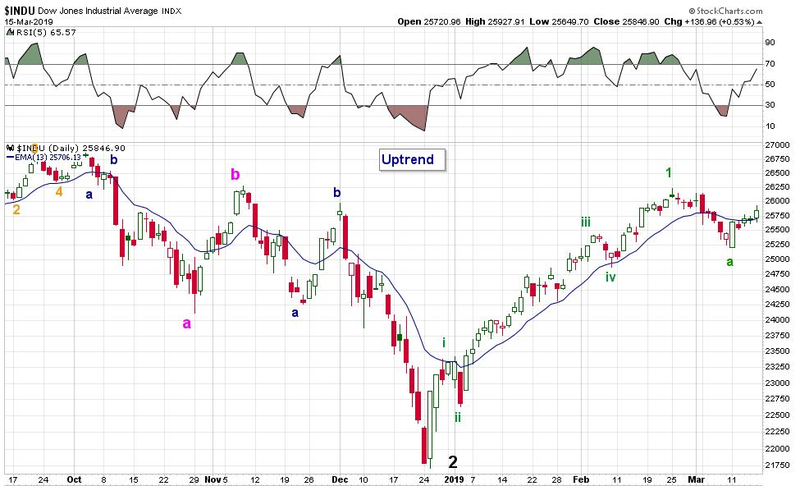 If the bounce stall at ~SPX2750 and heads lower, wave-a will likely turn into five waves first before wave-b takes hold. But, market breadth is currently so extremely oversold and at extremes from which normally already a snap back rally would have occurred on Friday. Thus odds favor a green start to the week”. Notice that SPX2832.44 is the 2.236x extension of wave-i, measured from wave-ii (wave-i: 2346.58->2520.32, wave-ii: 2443.96). 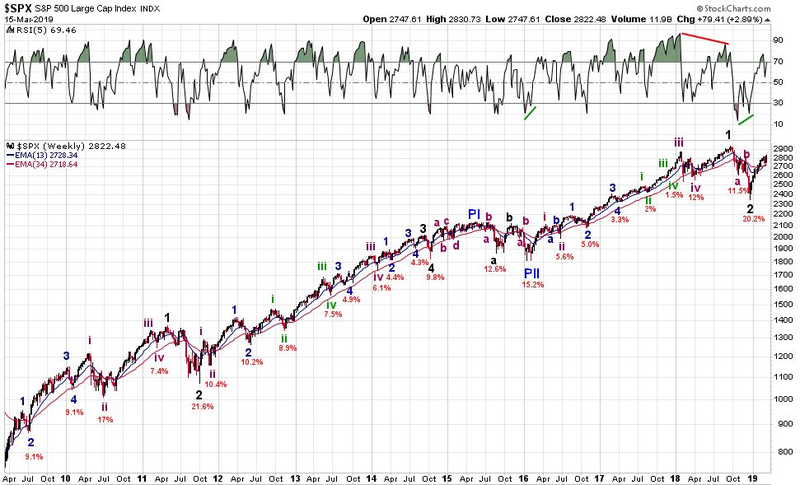 Wave-v topped at SPX2817 on March 4 and thus fell short of the ideal Fib-extension target. Often then the b-wave will do the job. Friday we got SPX2830.72; off by 1.72p. Close enough?! Thank you OEW group, much appreciated. The bullish count, If minor 2 is over, with a very shallow. .20 retrace. 473 up 95 down. then i would guess minor 3 would be 1.618 of minor 1 so 765 points from 2722. Bringing sp to 3487. Wow. Then with such a shallow minor 2. Minor 4 I would assume would be deep. .618 down to 3014 a 473 point correction then minor 5 equals 1 at 3487 again or a slightly higher high. if minor 2 hasn’t ended at we head lower. Minor 2 will probably end at 2642. We’re c is 2x a 95×2 190. 2732-190 is 2642.